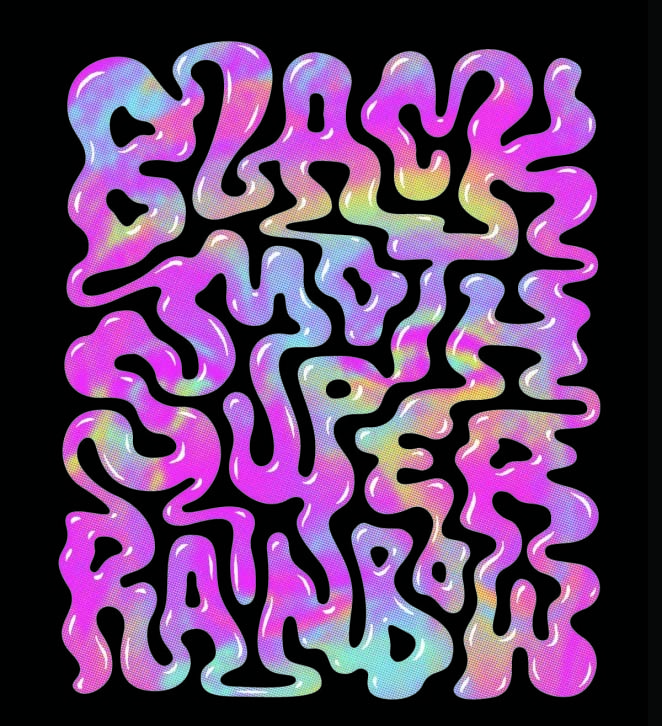 Weekly Update 2018-23: I can't get the vocoder from Black Moth Super Rainbow out of my head as I wonder why air conditioning units have features that are only accessible through their remotes, and take a trip down memory lane as I review my own personal concert history on Setlist.fm. 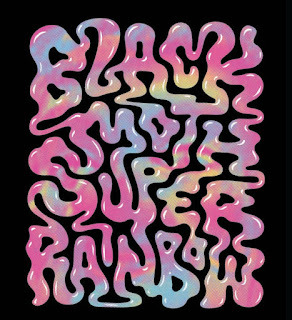 If you like psychedelic revival and heavy use of vocoder, look no further than Black Moth Super Rainbow to fulfill all your sunny day flower child music cravings. Originally from Pittsburgh, the band is currently composed of frontman, singer, and songwriter Tobacco whose vocals are altered via a vocoder; keyboardist The Seven Fields of Aphelion, who often performs with a classic monosynth; drummer Iffernaut; guitarist Ryan Graveface; and bassist Pony Driver. If that doesn't explain their music enough, suffice to say it will take you on an acid-induced trip through an omni-coloured labyrinth of candy and daydreams. It's also just really good music for hanging out outside. Their album art and concert merchandise also visually matches their sound, which makes me happy. Their new album Panic Blooms came out a month ago, and I highly recommend it. I didn't get a chance to attend a bike meetup last week because I was lucky enough to attend three concerts! All three of which were phenomenal. I was able to mosh in the pit at Parquet Courts on Sunday without getting hurt (though someone did spill beer on me), saw a gigantic floating whale "swim" above the crowd during The Mariner's Revenge Song at The Decemberists, and even won free tickets to see Death From Above (instead of the bike meetup). The bike meetups happen every week, so hopefully next week I can make up for it. I did manage to trade away my old air conditioning unit on Bunz, which was an ordeal in itself considering the high volume of offers. This last week was quite a heat wave, so people are pretty desperate for a unit. One of which (though not the winner of the item) happened to be an app designer for Bunz (Melanie), which was super cool. We ended up meeting for coffee, and she let me talk her ear off about design and working for Bunz. This weekend was a big one for T.Dot Batu - we headlined Dundas West Fest with the amazing Mestre Memeu, and played to a packed audience of thousands. It was amazing. I couldnt believe how many people showed up - I literally could not see the end of the crowd from the stage. It was so cool to see everyone dancing to our music, and to be a part of such a big event in general. But most of all, the true accomplishment goes to Pato, our leader, for spending so many years building the band to become what it is today. We're the only band in Toronto to play the Samba Reggae music of Bahia (his hometown), and we bring the multiculturalism to the people from Brazil, but also in the way that the band members are from different places all over the world. Mestre Memeu is with us in Toronto until Thursday, so we've got two more practices with him before he leaves. Beyond that, Melanie from Bunz has given me 20,000 Bunz BTZ to spend as part of an internal contest, so I'l be attempting to burn through the BTZ for something cool within the next two weeks. One of the merchants who accept BTZ is the Drake General Store - and there's no shortage of cool stuff to buy there. Upon trading my old air conditioning unit, I definitely upgraded with this new unit that my dad gave me. Possibly its best feature is the remote control it comes with, so I don't have to reach out to press the buttons on the machine itself (which are also really hard to press). I noticed that there are actually a couple of features on the remote that are not even accessible from the unit itself, which is also the case for my roommate's air conditioning unit. Something about this just didn't sit right with me, so I started to muse. What happens if you lose or break the remote? In some cases, such as that of my roommate's unit, the unit becomes useless. Luckily, my own unit's remote only provides one feature that is missing from the unit itself. My old unit that I just traded also had a remote, but I didn't even know that until I looked up the model to provide information in the Bunz listing. None of the features (or at least, the ones I ever needed) were only accessible through its remote, which is why I didn't even know it originally had a remote. Only being able to access certain features from the remote is similar to designing different things for different devices - don't exclude people who don't have the hardware, from accessing the software. An interesting parallel to this situation is when the interface designer world switched from graceful degradation to progressive enhancement. In a nutshell, this states to design the best experience for the smallest screen, and build up from there. It is outdated and simply incorrect to design a full experience for a desktop machine and a "lite" version for mobile that does not contain all of the desktop features. No one should be punished for having a small phone instead of a desktop computer, especially in this day and age. On the same vein, no one should be punished for losing or breaking their air conditioner remote. It happens! Hopefully not to me, but you never know. I'm pretty clumsy. And as a bonus, I simply cannot believe that this exact topic came up in one of my Facebook groups last night (after I had written the above section but before publishing). So it would seem this is a common problem that I'd argue could easily be fixed at the source. By all means, keep making air conditioning units with remotes, but don't make their features only accessible through the remotes! I have spoken about the power of crowdsourcing before on my blog, from Spotify giving me awesome music recommendations to Google telling me how long it will take to bike to work, to Kickstarter helping me find small-run products and projects to support. You may know that I attend a lot of concerts (freakishly even for me, three in the past week), so it should be no surprise that I am currently building a lifelong love affair with Setlist.fm. Who knew there was a website dedicated to being a setlist catalog of almost every concert I've ever attended? And for the ones that aren't there, I can add them easily. After painstakingly adding every concert I can remember, plus all the ticket stubs I've collected since 2008, my personal concert attendance is almost fully recorded on the site. 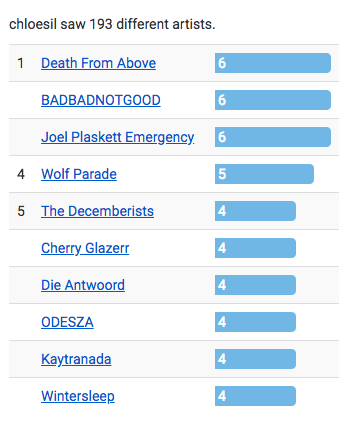 It spits out cool stats back at me, like which bands I've seen the most times and which festivals I've attended. I think Joel Plaskett actually wins here with around seven/eight concerts - too bad he has two different bands so his classification is split. Much as I do love to collect concert tickets and paper setlists (I have a few very special ones), I think this website will be much richer and helpful in being the main source for my concert-going history. I do wish it had a bit more of a social tie-in to help me find friends who have similar music tastes and the like, but it certainly does its basic job very well. Check out my profile and make your own!